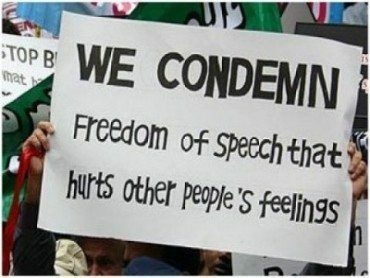 Free speech is under attack at college campuses across the country. The problem is not limited to a few colleges barring radical speakers to avoid a riot. 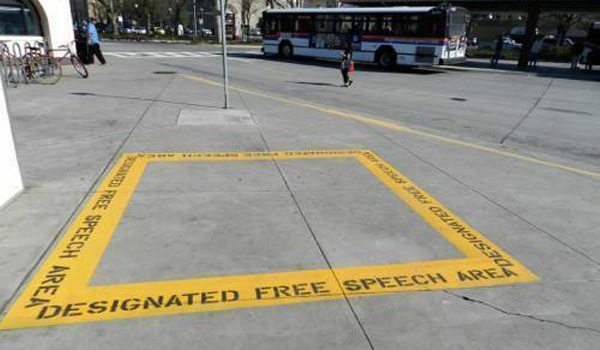 Universities large and small, public and private, are restricting students’ and professors’ speech or enabling others to silence speech with which they disagree. These restrictions take a variety of forms. 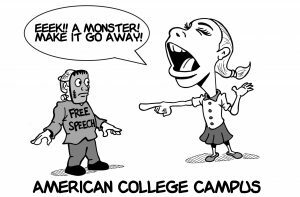 For example, speech codes at many colleges ban speech that is “offensive,” a subjective standard that allows college administrators to arbitrarily ban speech they find disagreeable. For example, Georgia Gwinnett College stopped a student from speaking about his religious faith because it “disturbed the comfort of persons” – even after he had gotten a permit from the school to speak. Other schools claim they allow free speech but impose so many rules and procedures that it is almost impossible for speakers to reach an audience. 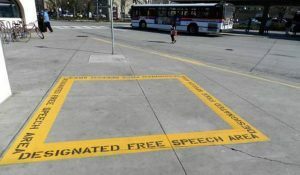 Pierce College in Los Angeles, for example, limited students’ “free speech” to a space the size of a couple parking spots and required a permit to speak even there. At a community college in Michigan, a student was arrested and jailed for handing out copies of the U.S. Constitution because they didn’t have a permit. Even where they don’t limit speech directly, schools’ actions often enable students to silence others’ speech through shouting, threats of violence, or actual violence. Sometimes schools fail to prevent students from intimidating and even attacking speakers, as happened at Middlebury College, where student protesters violently shut down a debate and physically assaulted one of the school’s own professors. In other cases, schools’ policies effectively encourage this behavior by imposing special limitations on speakers they deem controversial. A new policy at Berkeley, for example, imposes a curfew, security measures, and location restrictions for events that administrators decide are likely to “interfer[e] with other campus functions or activities.” It doesn’t require much creativity to turn this policy into a heckler’s veto. If you disagree with a speaker about to visit campus, simply declare his views offensive and threaten to riot, and the speaker will be sidelined. The net result of these policies has been a narrowing of the views expressed on campuses and therefore the range of views students hear. The heart of a university education used to be exposure to a wide range of ideas and the opportunity to debate their merits in order to inform one’s own positions and learn to articulate them persuasively. This has apparently taken a backseat to students’ desire to be comfortable and affirmed. University administrators, faculty, and students – not to mention the parents and taxpayers who are footing the bill – should be concerned that the quality of higher education is diminished by this change. And everyone should be concerned about threats to free speech, regardless of their political beliefs. It should not give anyone comfort that she disagrees with the speech that is being silenced at the moment. Viewpoints that are mainstream now may quickly become minority views, and vice versa, as has happened repeatedly throughout history. That is why protecting even unpopular speech in the short run benefits everyone in the long run. 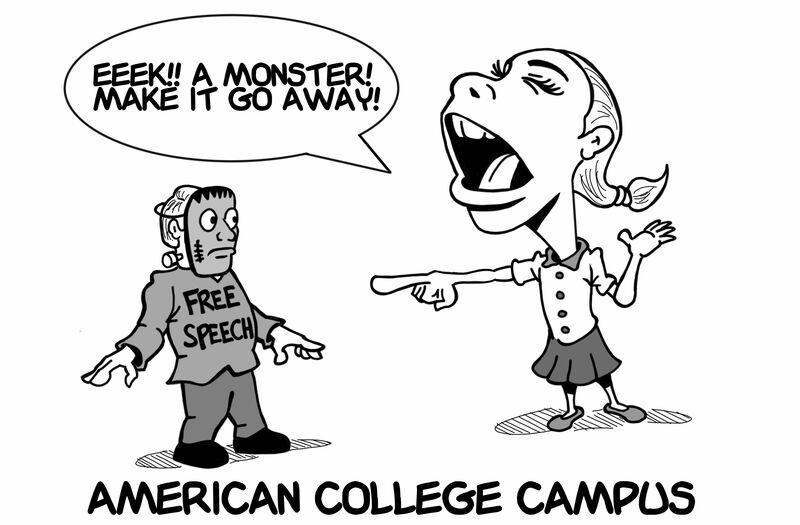 When public universities restrict speech, it has constitutional implications as well. The First Amendment prevents government institutions from imposing speech restraints such as arduous permitting restrictions or arbitrary curfews, particularly if the school discriminates against certain viewpoints. Yet this is precisely what many university speech policies do. The U.S. Department of Justice is not standing on the sidelines while public universities violate students’ constitutional rights – we are backing free speech lawsuits against universities that violate the First Amendment. 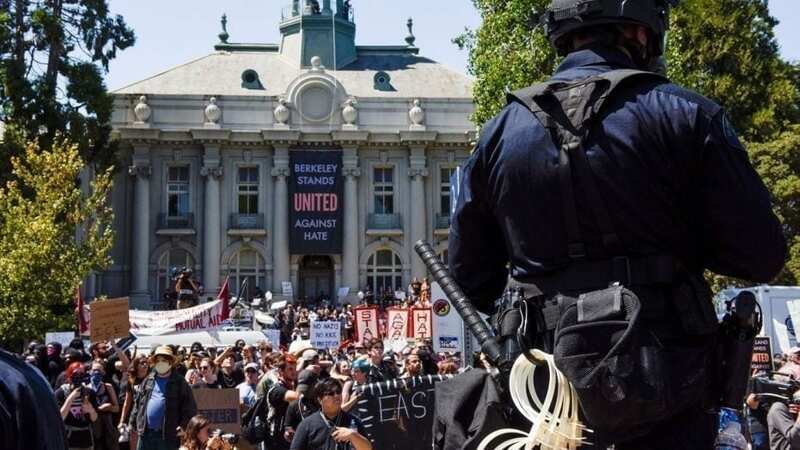 Thursday, we are filing a brief supporting a group of Berkeley University students who allege that the University’s policy imposing stricter rules on controversial speakers violates the First Amendment. This is the third suit in which we have filed such a brief, and it will not be the last. Defending the fundamental constitutional rights of all Americans is a core part of the Department’s mission, and defending free speech rights is particularly important. Free speech is not only a fundamental right, but, as James Madison said, the “effectual guardian of every other right.” Free speech enables citizens to advocate for all their other civil rights and is the single most powerful bulwark against government tyranny. This is perhaps why our Founders protected it in the very first amendment in our Bill of Rights. It is also why the Department of Justice is working so hard to protect it – free speech is too important for the Department of Justice not to speak on its behalf. Rachel L. Brand is Associate Attorney General of the United States. As Associate Attorney General, she serves as the third-ranking officer in the Department of Justice.